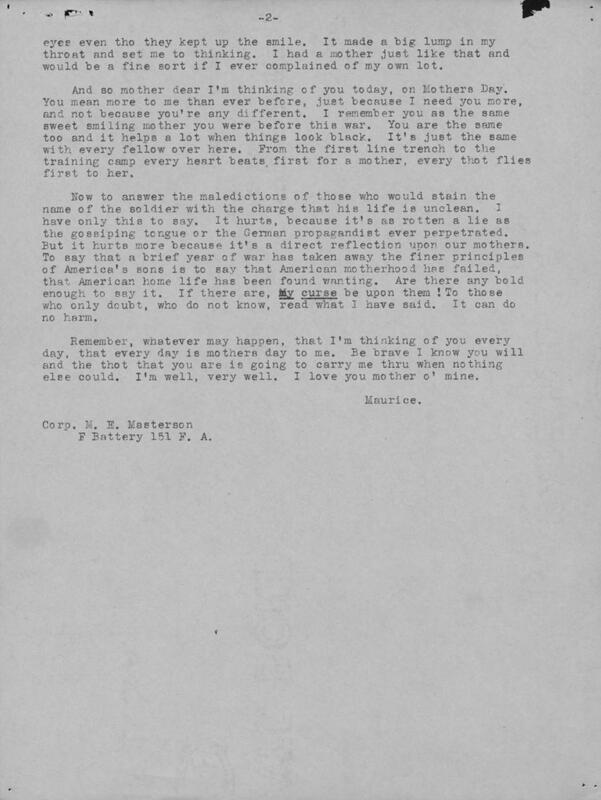 Maurice Masterson of Barnesville, Minnesota, sent this letter to his mother on Mother's Day, 1918, in which he describes how important she is to him. 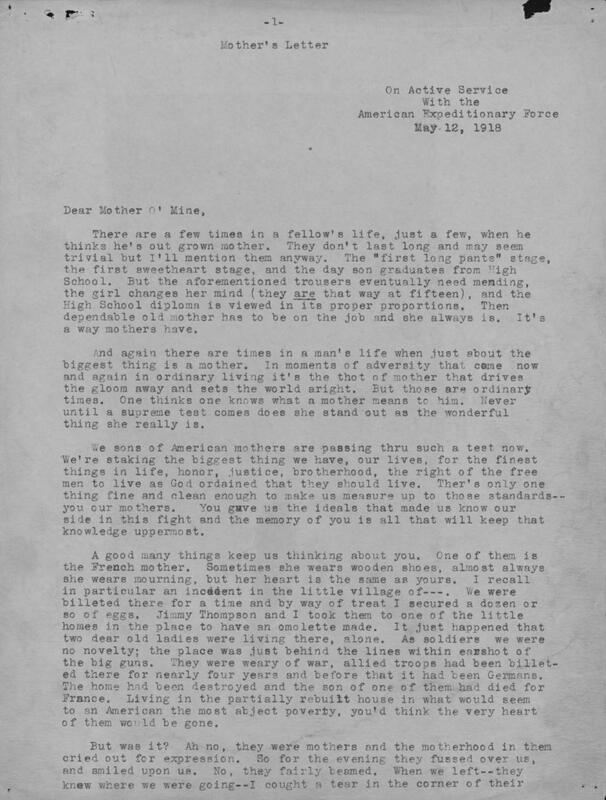 Masterson wrote numerous letters to his mother and father during his time in France. 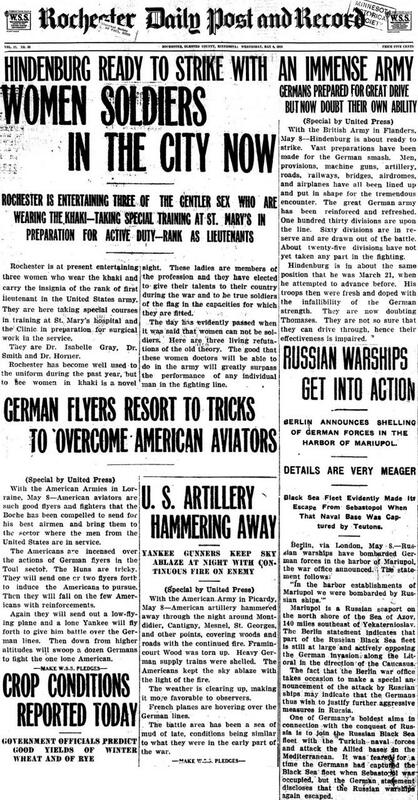 He was killed in action on November 1, ten days before the war ended. There are a few times in a fellows life, just a few, when he thinks he's out grown mother. They don't last long and may seem trivial but I'll mention them anyway. The "first long pants" stage, the first sweetheart stage, and the days son graduates from High School. But the aforementioned trousers eventually need mending, the girl changes her mind (they are that way at fifteen), And the High School diploma is viewed in its proper proportions. Then dependable old mother has to be on the job and she always is. It's a way mothers have. And again there are times in a man's life when just about the biggest thing is a mother. In moments of adversity that come now and again in ordinary living it's the thot [sic] of mother that dries the gloom away and sets the world aright. But those are ordinary times. One thinks one knows what a mother means to him. Never until a supreme test comes does she stand out as the wonderful thing she really is. We sons of American mothers are passing thru [sic] such a test now. We're staking the biggest thing we have, our lives, for the finest things in life, honor, justice, brotherhood, the right of the free men to live as God ordained that they should live. [...] And so mother dear I'm thinking of you today, on Mother's Day. You mean more to me than ever before, just because I need you more, and not because you're any different. [...] Remember, whatever may happen, that I'm thinking of you every day, that every day is mothers day to me. Be brave I know you will, andthe thot [sic] that you are is going to carry ,me thru when nothing else could. I'm well, very well. I love you mother o'mine. 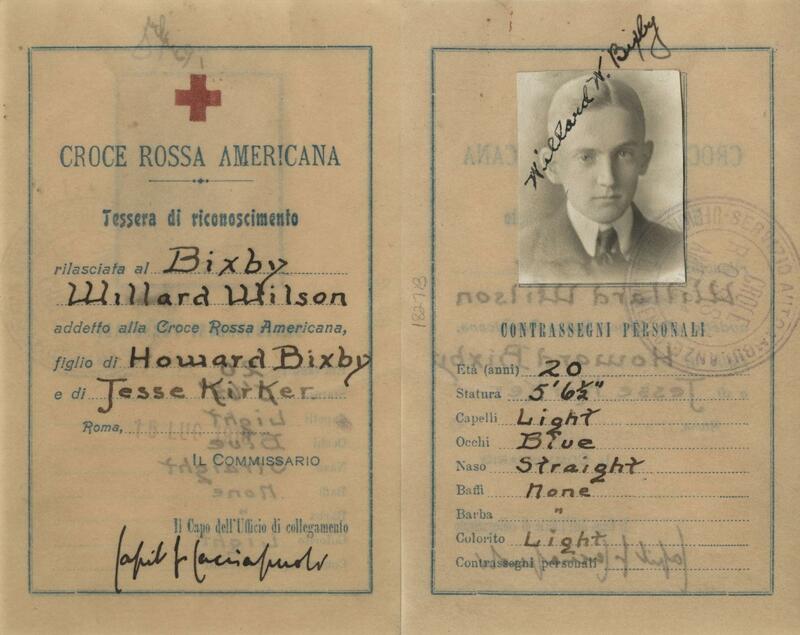 Willard W. Bixby was an ambulance driver with the Red Cross in Italy. 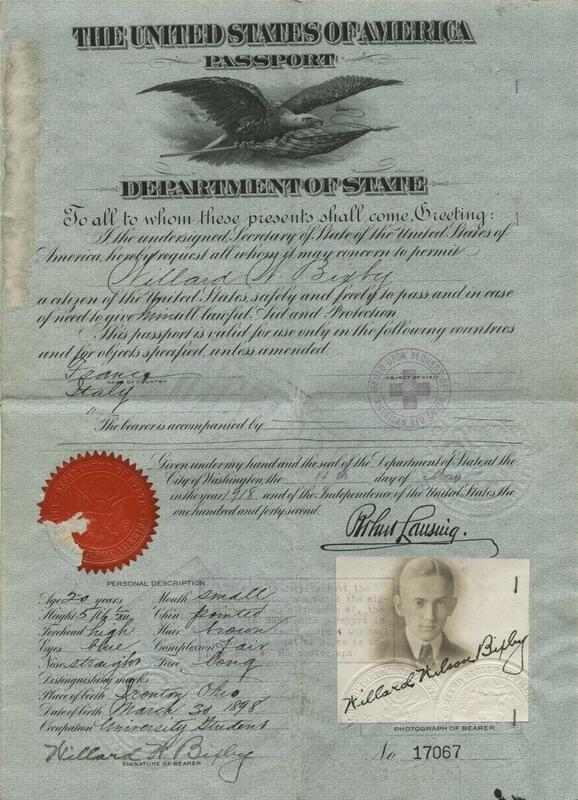 Bixby's passport was issued to him on May 11, 1918. 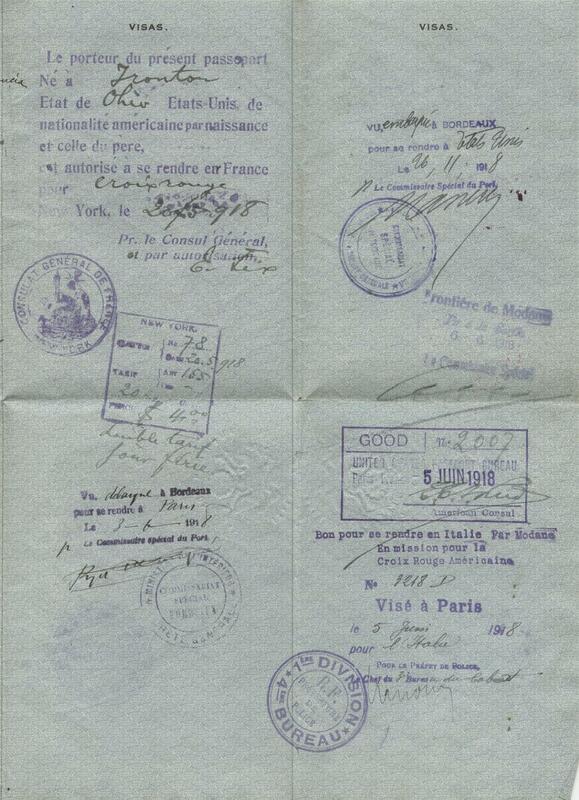 It contains both French and Italian Visas, and includes a Red Cross Identification card. 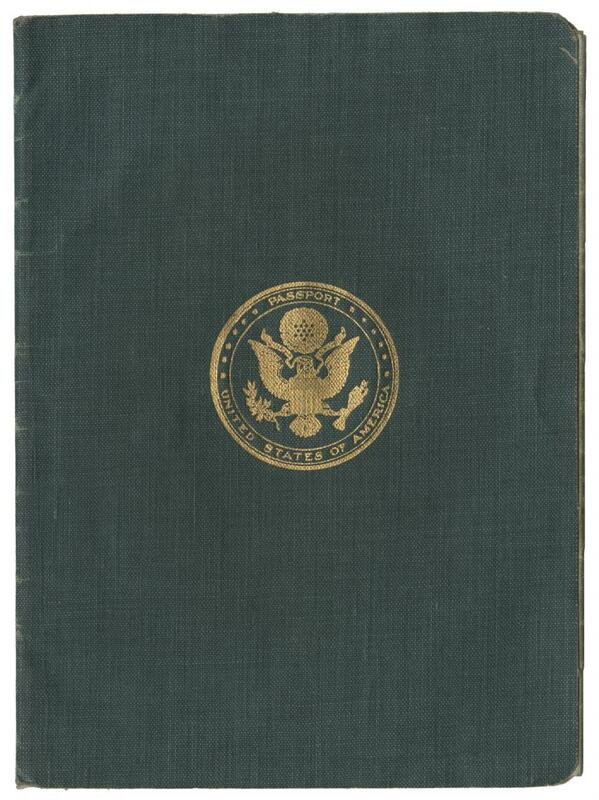 It is very interesting to see how US passports have changed and stayed the same since WWI. For example, all the different visa pages fold out instead of being bound into a small booklet as they are in modern passports. 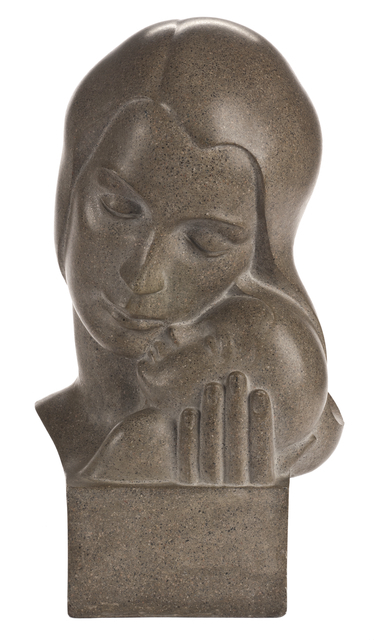 This sculpture was created between 1935 - 1942 by Ingrid Edwards as part of the Minnesota Art Project of the Works Progress Administration. It came to MNHS from the Ah-Gwah-Ching Archive. 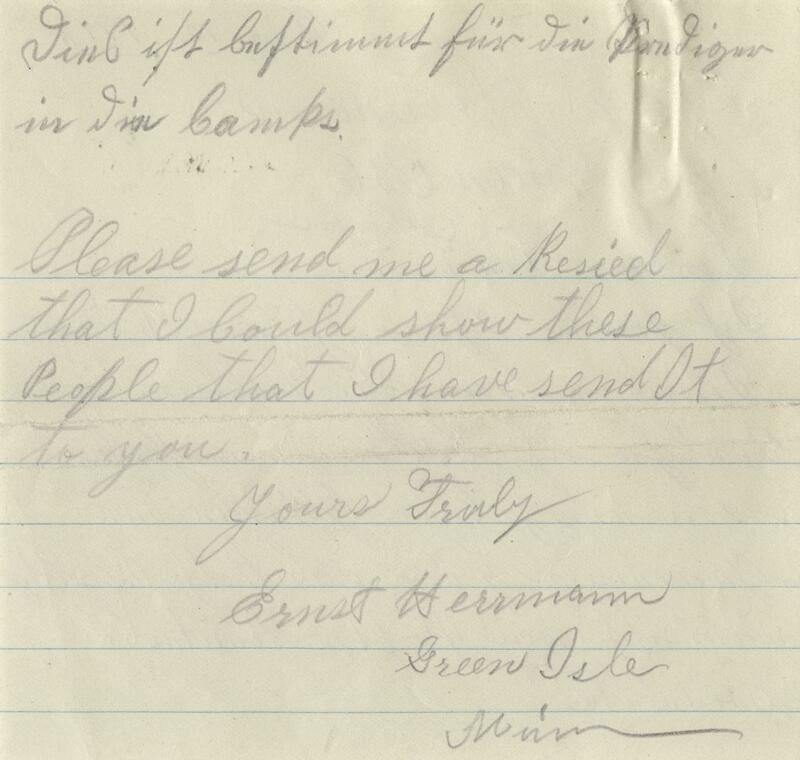 This letter was sent to the St. Paul Chapter of the American Red Cross by Mr. Ernst Hermann along with $24. 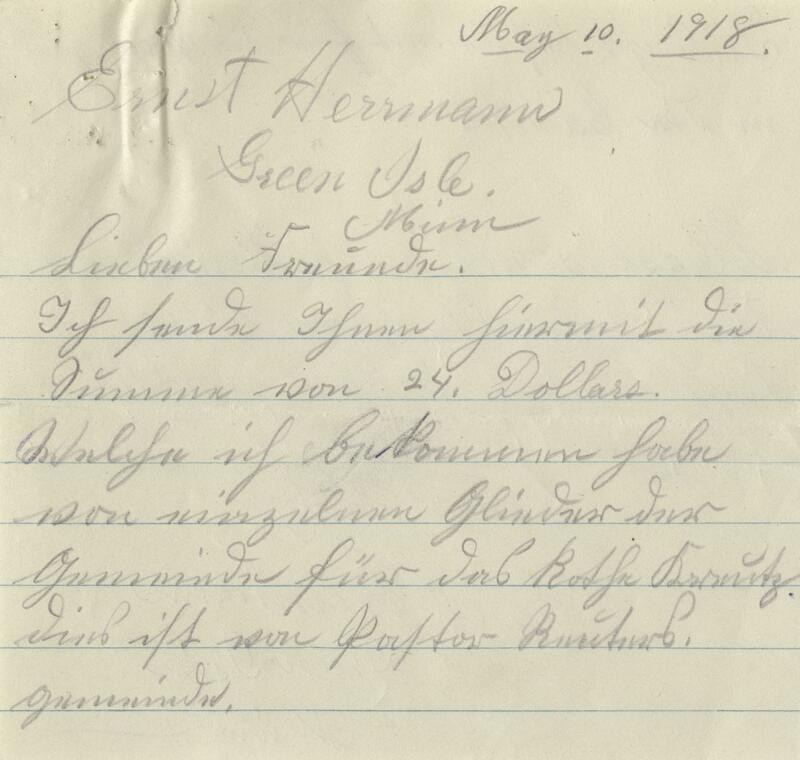 Though written in German, the Red Cross' translations reveal that the $24 was for chaplains in the army camps. 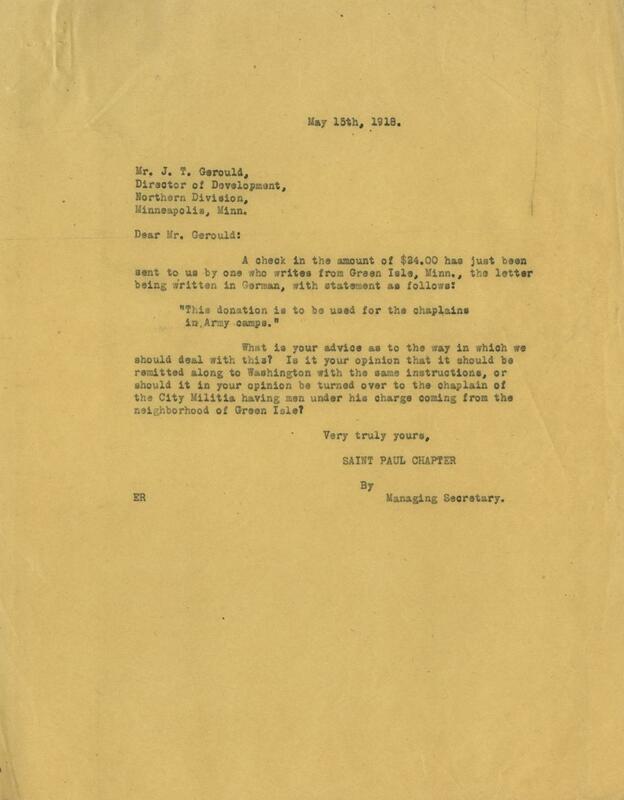 The Red Cross was not entirely too sure what to do with the money, as they do not usually receive donations in this way. They didn't know if the money should be sent to Washington with the same instructions or if it should just give it straight to the militia chaplain. 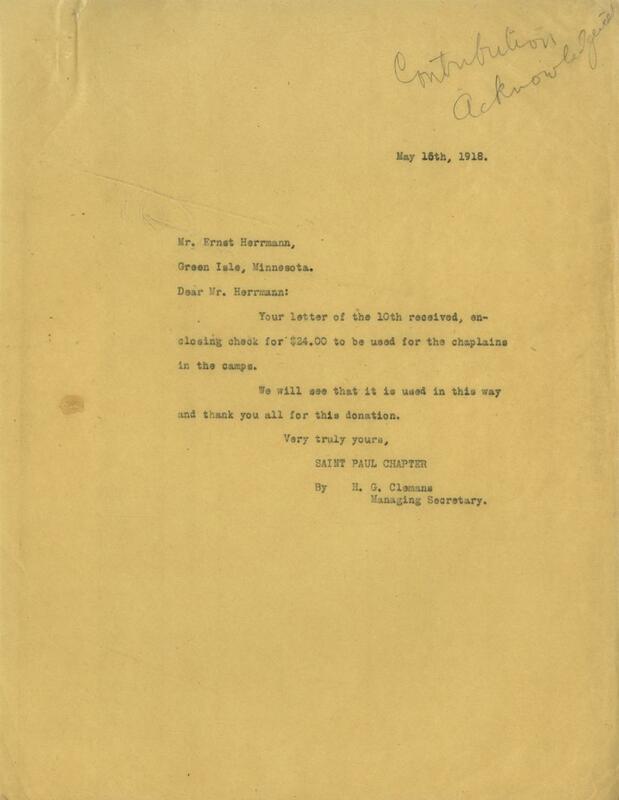 I am sending herewith check for the amount of $24.00 which I have received from Red Cross workers in this community. 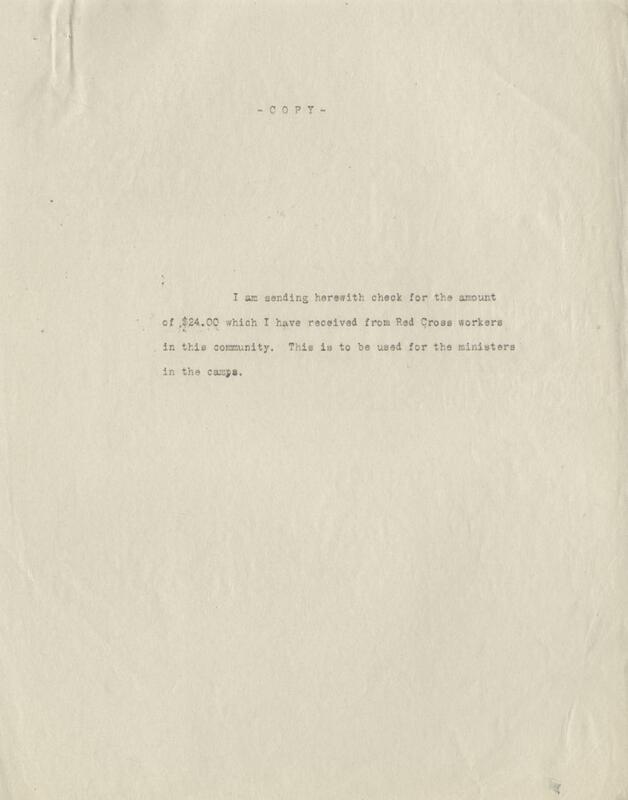 This is to be used for the ministers in the camps. 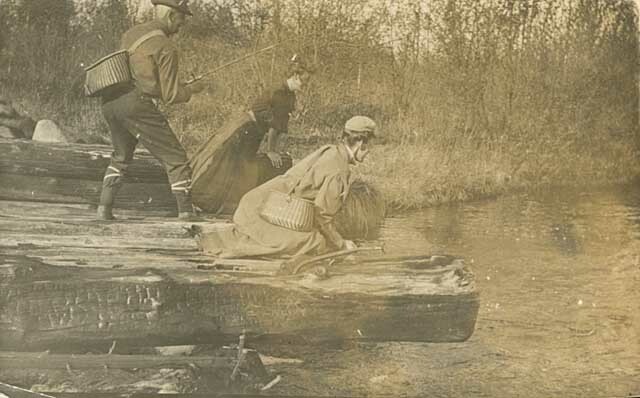 In honor of the fishing opener this weekend, we present this action shot of a group fishing in 1905. Hope he got it! And good luck to all the fishers out there! 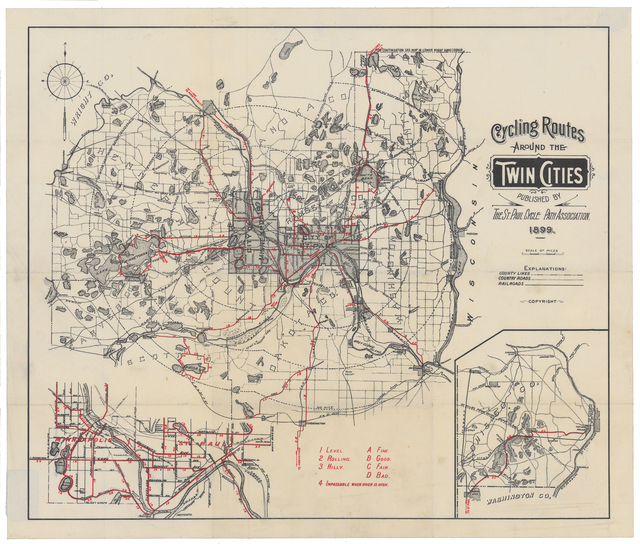 This map was created by The St. Paul Cycle Path Association in 1899. Wouldn't be great fun to compare this map with our paths today? 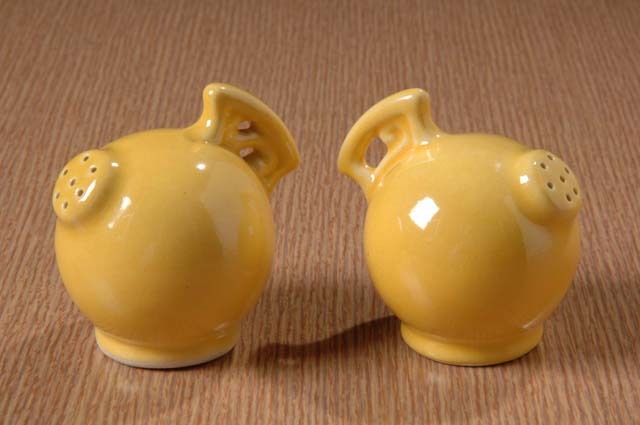 These salt and pepper shakers come from the second pattern of dinnerware introduced by Red Wing Potteries, produced from 1935 until the early 1940s. The pattern featured solid, bright colors in order to compete with what California potteries were doing at the time. 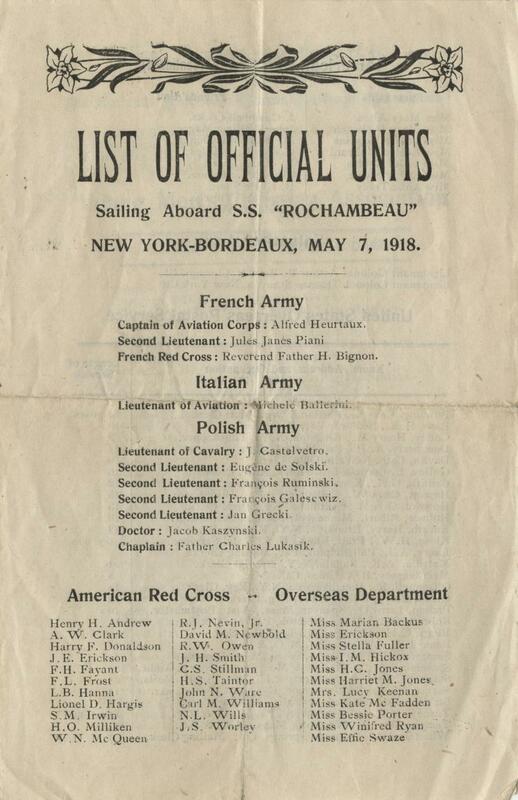 On this date Minneapolis Red Cross nurse Marion Backus sailed from New York to Bordeaux, France on the S.S. Rochambeau. 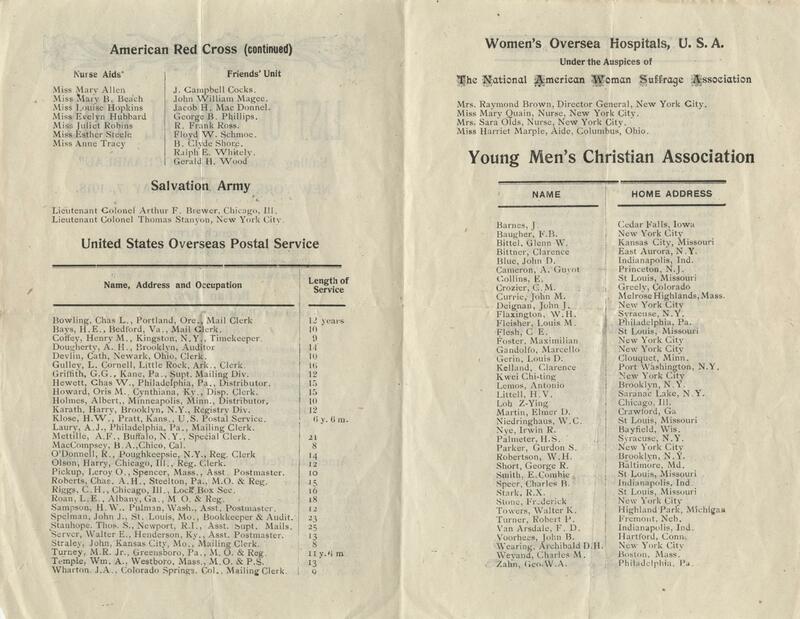 There was a "List of Official Units" who were sailing on the ship, including Red Cross workers and nurses, Postal Service men, and YMCA workers. 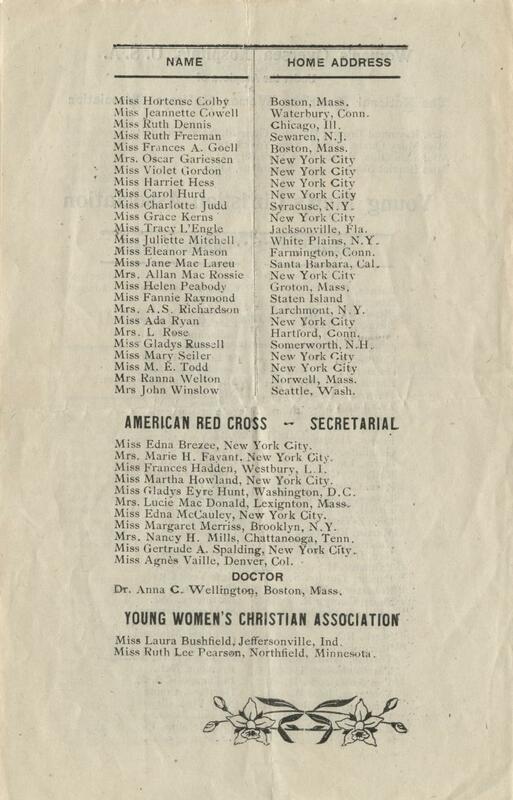 Marion Backus' name can be seen in the pamphlet. 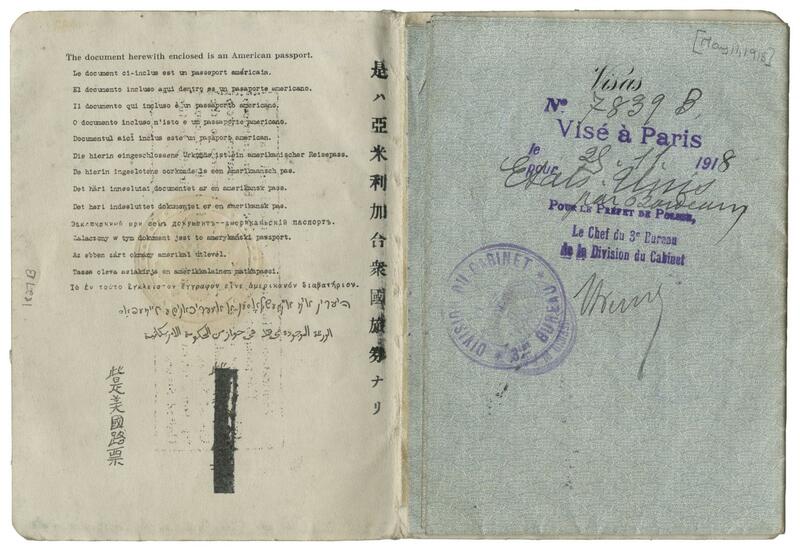 She arrived in Paris on May 18, 1918.